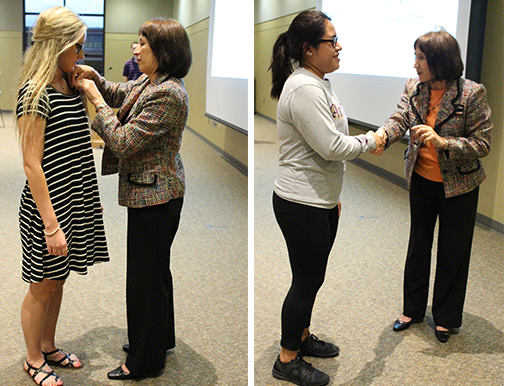 Cowley College’s Natural Science & Mathematics Department held its annual Mu Alpha Theta induction ceremony Tuesday night in the Earle N. Wright Community Room. Mu Alpha Theta is a national community college mathematics honor society. Membership is available to those students who exhibit the work ethic, ability, and leadership qualities necessary to excel in mathematics. The ceremonies included a formal induction during which pins and certificates were presented to each of the new members. Mu Alpha Theta members also become members of Mu Alpha Sigma Chi which is Cowley’s Math Club and is designed for fellowship and to increase awareness and appreciation of math and science in the community. Natural Science Department Chair, Dr. Michelle Schoon, provided the welcome and a department overview. Cowley College president Dr. Dennis C. Rittle spoke at the event, while mathematics instructor/co-sponsor Humphrey Wamocha introduced the Mu Alpha Theta Officers and mathematics instructor/co-sponsor Mike Hayden conducted the initiation ceremony. Along with Wamocha and Hayden at the Arkansas City campus, Uwe Conrad and David Hays serve as Mu Alpha Theta co-sponsors at Cowley College’s Mulvane Center. Mu Alpha Theta members inducted on Tuesday were Payton Baker, Melissa Bliss, Maggie Fink, Aubrey Herlocker, Brendan Lloyd, Starr LoNero, Brittney McNown, Elizabeth Mejia, Hoang Nguyen, Michaiah Nichols, Bradli Nowak, Joel Spain, and Claryssa Weis.